While ALL Wayne has its community Christmas tree, as reported in last week’s column, North Wayne has its own tree, located on a spot that seems built to order for that very purpose – the triangular piece of ground in the center of the wide opening of Walnut avenue onto North Wayne avenue. Last Sunday, December 21, there was carol singing around this tree and a program of Christmas music arranged by Frank Felske. 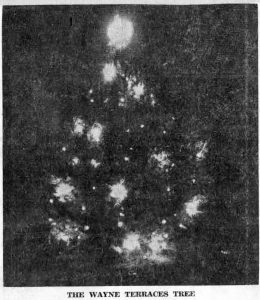 This is the second Christmas that the lights from this tree will have shone out onto Walnut and North Wayne avenues, the first street to be laid out back in the 1880’s in the section north of the Pennsylvania Railroad. Sponsored by the North Wayne Protective Association, which financed its purchase, this beautiful Nordman fir was finally chosen by a committee from the Association, after a tour of all the nearby nurseries had been made. Even after a selection had been made at the Doyle Nurseries by one group, a second group was delegated to verify the choice. After the Nordman fir was puchased it became a very personal belonging of the neighborhood. During the dry summer of 1952, members of the North Wayne Protective Association took turns watering it through pipes secured deep into the ground for that purpose. The Christmas lights come on from a switch in the home of Mrs. Helen H. Breining on the south side of Walnut avenue. Water comes from a spigot in the yard of Dr. Lee Porter’s home, on the other side of the street – the Porter children call it “our tree”. This permanent Christmas tree was preceded by a temporary one, a 60-foot fir which was blown down in the November, 1950, windstorm on the old McFadden place in Rosemont, then owned by Thomas A. Wood. In their eagerness to have a tree of some sort, members of the North Wayne Protective association went down to Rosemont in several cars to drag it up to the triangle in the middle of Walnut avenue. The return trip was a hazardous one with the car on which the tree was loaded closely guarded by other cars to the rear. The route had to be a circuitous one since there were only a few corners which were wide enough to permit a turn. Finally, however, the destination was reached, and the trunk of the tree was sunk into a big pipe provided by the township for that purpose. Some ten feet of the original hemlock had to be cut off to make the planting possible, and numerous branches were broken off in one way or another. Undaunted members of the tree planting committee then nailed the original branches back, or chose still others to be nailed in place. And then, several nights before Christmas of 1950, lights shone out from North Wayne’s first Christmas tree. Needless to say, this tree was a short-lived affair. 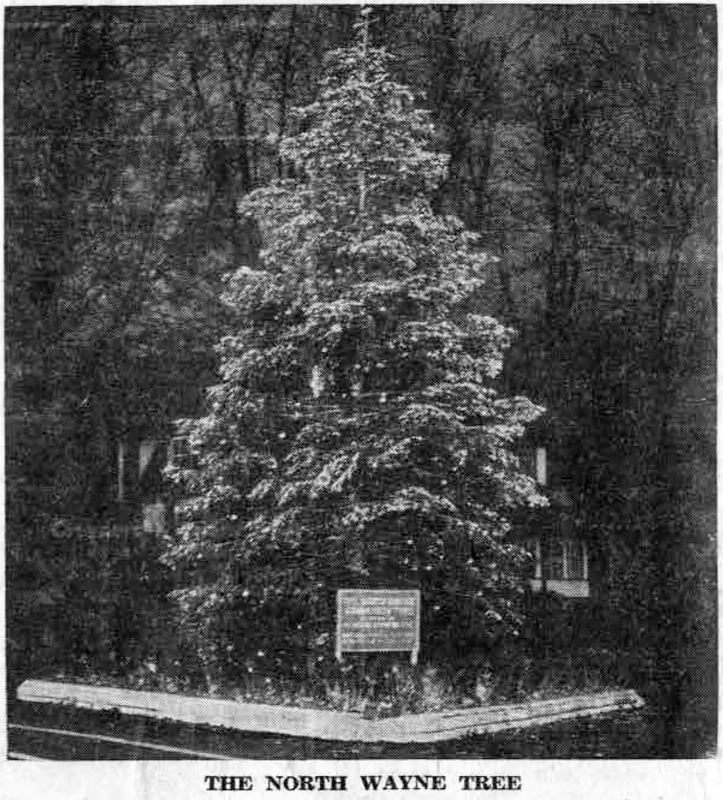 But by Christmas 1951, the big hemlock was permanently in place. This year, for the second time, its lights twinkle in the darkness. Now there is a brand new tree in the community – the one on Morningside Circle in Wayne Terraces. 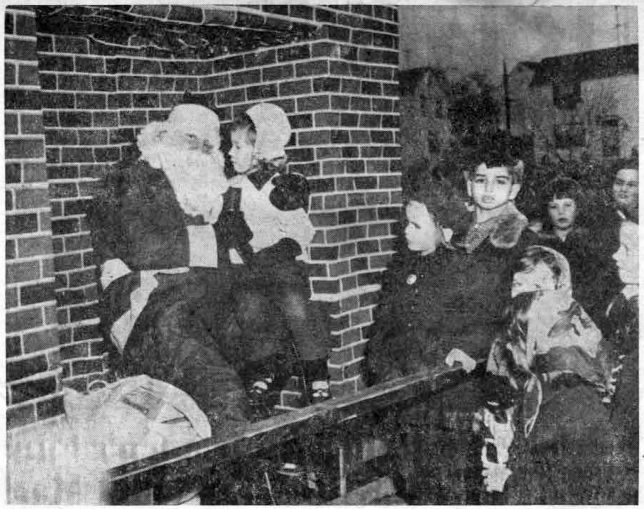 On Saturday afternoon Santa Claus arrived there in one of the shiny red fire engines of the Radnor Fire Company to seat himself on his throne beneath the tree. From there he distributed his gifts to all the children of the Terraces. This was followed by singing of carols. On Monday evening, December 22, the Rosemont Community Association had its fourth annual Christmas celebration on the grounds of the Rosemont School. A nativity scene near the Christmas tree formed the background for the carollers. In the spirit of giving rather than receiving those who came to the celebration brought gifts to the creche in the form of toys and of food. And thus throughout Radnor township Christmas is being celebrated not only in its homes, but in gatherings throughout our community in the true spirit of “Merry Christmas to All”. It is this spirit that prevails in our community not only at the Yuletide season, but throughout the year – that spirit of true neighborliness. And now Merry Christmas to all her readers from this columnist with an especial greeting to the increasing number of those of school age who are showing such interest in the history of Wayne and its surroundings. May we all spend another happy year together – your columnist in writing and you in reading! As the lovely notes of ”Oh Come All Ye Faithful” rang out into the wintry twilight of last Sunday afternoon from the group of carollers, young and old, who were assembled around the newly planted Community Christmas tree, the memories of some few among them went back over the years to other Christmas trees in other parts of Wayne. 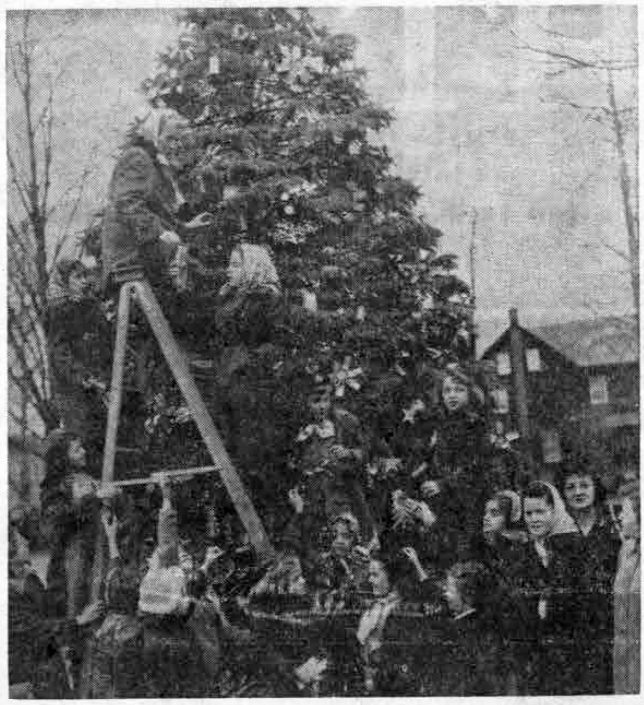 First of these community Christmas trees was the one planted to the right of the Wayne Primary School, at the instigation of a woman always deeply interested in civic affairs, Mrs. James B. Riley, who lived for many years on Pembroke avenue. 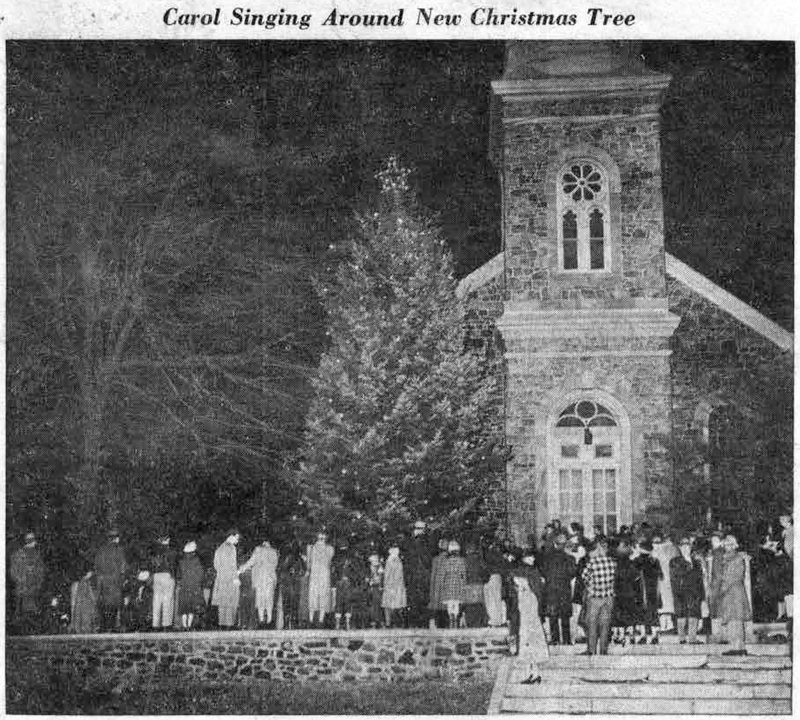 In the early 1900’s she arranged for the planting of this fir tree in a spot where there would be ample space for carollers to gather around it. Though never a lighted tree, it created a center for outdoor Christmas music for several years. After it was deserted for a more centrally located tree, it became the “birds’ Christmas tree”, decorated with choice tid-bits of food for the small feathered friends of the children of the Wayne Primary School. This trimming of the tree for the birds remained a custom until a few years ago. Then there was the big fir tree on the Louella grounds near the mansion. Groups of young carollers gathered around it as they made their rounds along the streets of Wayne and St. Davids, before arriving at St. Mary’s Church in time for the Christmas Midnight services there. Later, in December, 1922, carol singers gathered for the first time around the well-remembered, beautiful, tall fir tree, located where Halligan’s toy store now stands. For many years it was one of the Christmas landmarks of the Main Line, as its many lights shone out along Lancaster Pike. That Christmas season of 1922, when it was first lighted, Edgar L. Hunt, organist at St. Mary’s Church and music instructor at Radnor High School, led the singing around the tree. Many felt that this tree and the ground around it should in some fashion have become the permanent property of the Township, in order that its lights at Christmas time should continue to shine down through the years. But that was not to be. 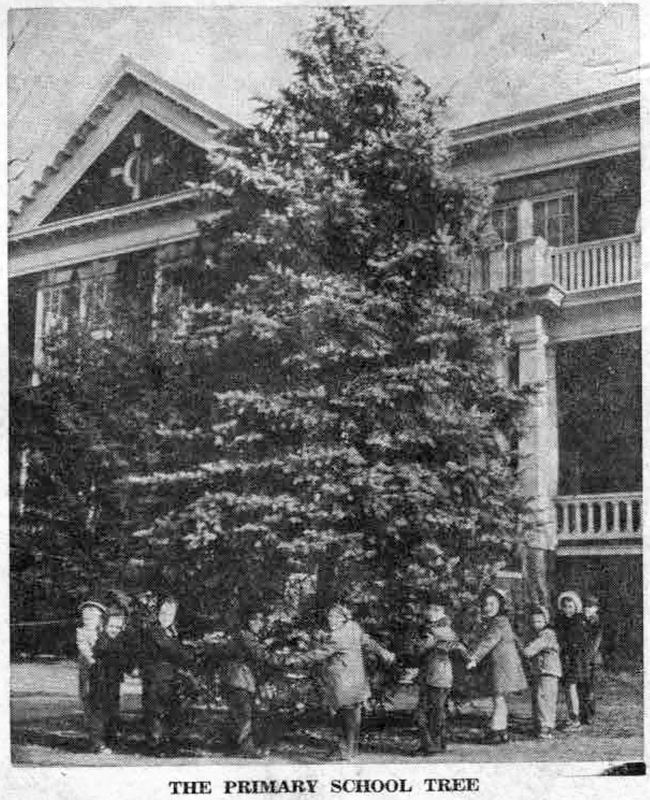 And now again Wayne has a handsome Christmas tree of its own, which may be seen on page 1 of this issue – the gift of Mr. and Mrs. E. Mortimer Newlin, given in memory of their young son, Frank Battles Newlin, who was killed in an automobile accident during the year just past. Three members of the Community Garden Club were on the committee to select the variety of tree which should be chosen and the site which it was to occupy. Much thought was given to both questions by Mrs. P.H. Mell, J. Armstrong Mills, and Roy Kersey. 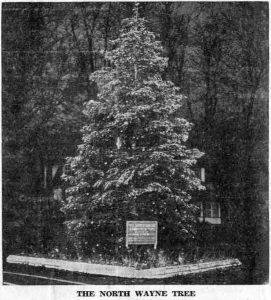 Finally, a Douglas fir of the largest dimensions that could be transplanted, was chosen from the stock of William H. Doyle, of Berwyn, a well known nurseryman. Many sites along Lancaste Pike had to be ruled out because of plans for future widening of the roadway. The location finally chosen is just to the left of the entrance of one of the community’s oldest churches – the Chapel of the Wayne Presbyterian Church, built more than 80 years ago on ground donated by J. Henry Askin, founder of Wayne. With its twinkling, multi-colored lights below the clear white star at its tip, it is indeed a beautiful sight to be enjoyed alike by Wayne residents and the many passers-by along the highway. The gratitude of the community goes out to its donors, Mr. and Mrs. Newlin, to the Presbyterian Church and to the Garden Club members, who are the custodians and caretakers of the tree. This gratitude the community is expressing in some small way by its lighting of the tree. It will be 17 years ago next Sunday, that Wayne celebrated its never-to-be-forgotten “Anthony Wayne Day” with some 2000 people marching in the largest parade this community has ever known. The eight highway signs which have been pictured and described in this column during the past few weeks had been completed and put in place ready for their unveiling, and for their formal presentation to Radnor Township. Already they had been on public exhibition in the John Wanamaker store, with many miniature wagons and coaches of Colonial and Revolutionary days furnished for the occasion by the Franklin Institute. 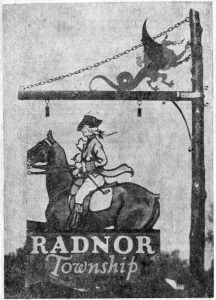 Now they were in their permanent places on Lancaster Pike and on Conestoga road, each of the eight swinging from a red cedar post, topped by an heraldic Welsh dragon. The posts had been designed by Herbert S. Henderson, an engineer and artist who is still a resident of Wayne. 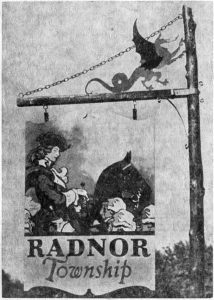 The eight signs, similar in shape, as were the posts from which they swung, had all been designed by Arthur Edrop, now a resident of Radnor and a recent president of the Wayne Art Center. Of the eight, six had been painted by Mr. Edrop, while the remaining two were the work of Wayne Martin, at that time an art instructor in Radnor High School. The Welsh dragons which topped the red cedar posts were also designed by Mr. Edrop, chosen by him to commemorate the fact that this section of the Main Line had been originally of Welsh origin. Of the various projects successfully undertaken by the group up to this point, perhaps the most noteworthy had been the planting of some 800 dogwood trees by such groups as Valley Forge Military Academy, the Wayne Hotel, the Central Baptist Church, Colonial Village Women’s Club, St. Katharine’s Church, American Legion Auxiliary and the Wayne Presbyterian Church. Other groups later joined these original ones. And so to the Wayne Committee for Civic Progress goes much of the credit for the profusion of dogwood which blossoms in the spring of the year throughout Radnor township. All stores in the township were closed on the Saturday afternoon of December 14, 1935, in honor of Anthony Wayne Day. Spectators lined the sidewalks as the various divisions of the parade marched westward along the pike to the stand opposite the Wayne Library. Here the 2000 who participated in it were reviewed by two military notables, Major General Edward C. Shannon, 28th Division, Pennsylvania National Guard, and Colonel Clarence R. Day, chief of staff, 79th Division, U.S. Army. Heading the parade were the Radnor Township police, with Colonel F.A. Warner and staff; the band and battalion of the 11th Infantry; a company of the 103rd Engineers, the 103rd Cavalry Troop; Battery C, of the 107th Field Artillery; the staff of Valley Forge Military Academy; six army trucks and four cannon, all making up the First Division of the Parade. In the Second Division were Colonel Horace W. Shelmire and staff; Anthony Wayne Post, American Legion; Bateman-Gallagher Post, American Legion; John Winthrop Post, of Bryn Mawr; Dalton Wanzel Post, of Paoli; Sons of Veterans Squadron, of the American Legion; Auxiliary of Bateman-Gallagher Post and the Auxiliary of John Winthrop Post. In the Third Division were Lieutenant Richard F. Warren and staff, Colonial and Revolutionary Orders Color Guard. The Fourth Division was made up of the Radnor High School Guard with the High School Band. Comprising the Fifth Division were the Valley Forge Memorial Chapel Washington Guards, District Boy Scouts with Henry Soleliac, commissioner in charge; Rover Scouts, Paoli Troops 1 and 81; Malvern Troop, Berwyn Troop, Devon Troop, Willistown Troop and Rosemont Troop. In the Sixth Division were Wayne Girl Scout Troops 131 and 224; Aberdeen Avenue Boys’ Club and pupils of St. Katharine’s School. The Seventh Division was an equestrian group, while the Eighth Division was made up of members of the Radnor Fire Company, Old Pump Engine, LaFrance engine and various old-time vehicles. As this huge parade marched along, headed by its chief marshal, Colonel Shelmire, of Wayne, they paused at the site of each of the roadway markers. At each of these posts a guard of Boy Scouts was stationed. Betsy Ross flags, which draped the highway signs, were drawn aside by Girl Scouts and by members of the American Legion Auxiliary as the parade came abreast. Once the parade was over, spectators and paraders alike crowded into the auditorium of the high school, where a mass meeting was held. Chief feature of the meeting was the formal presentation of the eight roadway signs to the township. The ceremony of presentation was made by the late Rev. Croswell McBee, then rector of Old St. David’s Church, while their formal acceptance was given by Joseph M. Fronefield 3d, at that time president of the Board of Township Commissioners. Prior to the presentation, the late W.W. Montgomery, Jr., of Radnor, paid tribute to “Mad” Anthony Wayne for his fidelity to the cause of the American Revolution. The afternoon closed with a special music program presented by the combined glee clubs of the High School, the Musical Coterie, the Merriemen of Wayne and a group of Welsh singers in national costume. In the evening Frederick Richardson was host to the reviewing officers at a dinner at St. Davids Golf Club. At the time of this presentation of the roadside markers to the township, 12 local organizations supported the work of the Wayne Committee for Civic Progress. These were the American Legion Auxiliary, as represented by Mrs. Lillian B. Aman and Mrs. Channing W. Daniel; the Garden Club, by Mrs. Duffield Ashmead, Jr., Mrs. Charles W. Bayliss and the Misses Susan Dorothy and Virginia Keeney; the Musical Coterie, By Mrs. Edward Higgens and Mrs. E.B. Warner; the Neighborhood League, by Miss H. Velma Turner and Adolph Rosengarten; the North Wayne Protective Association, by Dr. Seneca Egbert and C. Laurence Warwick; the Saturday Club, by Mrs. W.N. Stilwell and Mrs. T. Magill Patterson; the Wayne Art Center, by Dr. Addison S. Buck, Charles A. McClure, Frederick Richardson, Clarence J. Tolan, Arthur Edrop and Miss Mary Walsh; the Wayne Chamber of Commerce, by A.A.H. de Canizares and M.L. Vail; the Wayne Library, by George L. Harrison; the Wayne Public Safety Association, by Dr. A.J. Culver and Charles M. Shepler. Members-at-large were J.M. Fronefield, 3d, and Frank Paul Kane. Mr. Edrop was chairman of the Wayne Committee, while Mrs. Patterson was secretary. An outstanding and unusual organization for the few brief years of its existence, the Wayne Committee for Civic Progress is now inactive. The handsome roadside signs hung from their posts until a few years ago. Then winds and weather made their removal seem advisable. The posts still stand, the Welsh dragons still atop them. The signs are safely stored in the studio of the Wayne Art Center. Their colors have been dimmed by time. Otherwise they are intact, with repainting their only requisite. It will be interesting to know whether there is enough public interest in these handsome roadside markers to have them swing again from their old posts along two of the oldest highways of America – the Lancaster Pike and Conestoga Road. Of the eight roadside signs which were presented to Radnor township by the Wayne Committee for Civic Progress in 1935, six have illustrated recent columns of “Your Town and My Town”. The final two of the series, as shown in today’s column, are those marking the limits of Radnor township along Lancaster pike. One, placed near County Line road as it crosses the Pike at the bottom of the Rosemont hill, marked the eastern boundary, while the other stood on the Pike near the Covered Wagon Inn to mark the western boundary. Two others showed the boundaries of St. Davids, while two more did the same for the Wayne district. All of these were along the Pike while the remaining two of the series were on Conestoga road to mark the boundaries of Ithan. The first picture shown in today’s column has been named “the Toll Gate” by Arthur Edrop, the artist who designsd and painted it, while the second is called “Old Lancaster Pike”. The first is one of the most attractive of the eight in the series, showing, as it does, a fair equestrienne in a riding habit typical of the late 1700’s. Sitting very erect on her spirited black horse, her riding crop in her hand, the lady is apparently receiving homage from four of her admirers. Whether they were awaiting her at the toll gate, or just happened by, is not quite clear in the picture’s title. The word “toll” dates back through the centuries, a word of Greek derivation originally meaning “something counted”. Later, as tax collectors had to count sheep and many other things, the idea of counting became associated with taxes. At first any kind of tax was a “toll”, although later it was only a special tax as defined above. During the 18th and 19th centuries it was a word that every traveller over the turnpikes of America came to know. Toll gates were placed at regular intervals along the roads to halt passing horsemen or vehicles. These gates were raised only after the traveller had paid a toll, the amount of which varied, that for the man on horseback being about five to ten cents, and possibly twice that sum for a team and a wagon. The proceeds of this tax were used to pay for road repairs, such as they were, in those early days of travel along the highways of America. Our own Lancaster pike, as it goes through Radnor township, is the first stone turnpike in the United States. Replacing the old Conestoga road which connected Philadelphia with Lancaster, construction on it was started in 1792 and finished in 1794 at a cost of $465,000, financed by a private company. Along its 62 miles, between Lancaster and Philadelphia, there were originally nine “toll bars”, beginning two miles west of the Schuylkill River. To the many German travellers who passed along this early stone turnpike, these toll stops were known as “Schagbaume”. Writing in “The Old Main Line”, J.W. Townsend tells of later days in the history of toll gates in this immediate vicinity. All the roads in the early 1870’s in the Bryn Mawr section were dirt, except Lancaster pike “which was very rough and ridgey, without any smooth surfacing”. When Mr. Cassatt, then vice-president of the Pennsylvania Railroad, who “was fond of driving his four-in-hand coach” was finally prevailed upon to accept the position of township road supervisor, things changed for the better. He was not only instrumental in obtaining macadamized roadbeds on Bryn Mawr roads, but he got a company of his friends to buy Lancaster pike as far as Paoli, in order to make a macadamized road of it also. Toll was charged “to keep it in order… and it was a great boon to the driving public for many years.” When the pike was purchased by the State in later years the toll gates were abolished, as all state owned roads were maintained by taxes. Many residents in this vicinity remember those toll gates which, as a matter of fact, were not abolished until some years after the turn of the century. A picture of the small cottage which once served as a toll house at the northwest corner of Lancaster pike and Chamounix road illustrated this column in the October issue of “The Suburban”. Another house, which is said to have served as a toll gate along the Pike in Revolutionary days, is the small white stone house just to the west of the Spread Eagle Mansion, on the Pike in Strafford. Standing as it does just at the line of the roadway itself, it is a very likely spot for a toll house.